No. 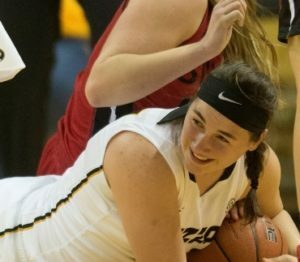 6-seeded Mizzou Women’s Basketball (22-10) advanced to the second round of the NCAA Tournament with a thrilling 66-64 victory over No. 11-seeded South Florida on Friday night in Tallahassee, Fla. Senior guard Sierra Michaelis made a go-ahead game winning basket with 0.6 seconds left to lift Mizzou past the Bulls. Michaelis poured in a team-high 16 points, including 13 second-half points to lead Mizzou. She added nine rebounds and two assists in a gritty effort. Sophomore forward Cierra Porter secured her team-best 12th double-double of the season with 11 points and 12 rebounds. Redshirt senior Lindsey Cunningham and sophomore Sophie Cunningham added 13 points and 12 points, respectively, to give Mizzou four players in double figures. The Tigers trailed 38-25 at halftime, but outscored the Bulls 41-26 and shot 48.8 percent from the field in the second half. It marked the largest halftime deficit Mizzou has erased this season. The win gives Mizzou victories in back-to-back NCAA Tournament appearances for the first in program history. The Tigers now have six NCAA Tournament wins in program history and have advanced to the second round for the second consecutive season. It was the Tigers’ first one-possession NCAA Tournament win since 2001 and Mizzou’s fourth total win by three points or less in the Big Dance. Facing a 13-point hole coming out of halftime, Mizzou exploded offensively to begin the third quarter, scoring seven unanswered points to close the gap to 38-32 with 5:47 left in the frame. After an and-one by freshman Amber Smith and a South Florida technical foul gave Mizzou a five-point possession, the deficit was cut to 41-37. Heading in to the fourth quarter, the Tigers trailed 46-43. Michaelis took over to begin the final frame, scoring Mizzou’s first nine points of the fourth quarter, sandwiching a contested three-pointer with a trio of layups. With Mizzou down 53-52, Porter buried a corner triple to push the Tigers in front for the first time since the 3:29 mark of the first quarter. Mizzou’s lead swelled to 62-56 before South Florida chipped away with four consecutive free throws. After both teams traded foul shots, Mizzou held a 63-60 edge with 16 seconds left. The Bulls tied the game at 63-63 with a deep trey with three seconds remaining. That set up Michaelis’ epic buzzer-beating layup that sent Mizzou to Sunday’s second round game. Mizzou will face host Florida State on Sunday with a trip to the Sweet 16 on the line. An official tip time has yet to be determined.